August 22, 2015 by The Junkie 0 comments on "For Learners: The Top 10 Korean Learning Strategies"
Let’s talk about Korean learning strategies. There is one great strategy that you’ll see here again and again. It’s reviewing. And it comes in many forms. So, today, you’re going to learn the top 10 Korean learning strategies (be sure to add your own in the comments so we can make this a top 20 list!). These will help you speak, read, and understand Korean better. Now, reading advice is one thing. Any dummy can do that. Putting it to use is another. So let’s get to it. You’ll learn Korean learning strategies. You’ll learn how to read & say them in Korean (which means you learn even more Korean). Hangul, Romanization, Translations. Feel free to print this out for your own review. 1. Listen and read along to understand Korean better. 한국어를 더 잘 이해하기 위해 들으면서 읽으세요. Hangugeoreul deo jal ihaehagi wihae deureumyeonseo ilgeuseyo. This my favorite Korean learning strategy. It’s one of the fastest ways to improve your reading, understand and speaking skills. And boosting grammar and vocab. All at the same damn time. Sounds too good to be true… but it’s not so easy. Why? To make it possible – you absolutely need the text of the audio that you can read along with while you listen to an audio lesson. Most resources won’t give that to you. That’s why it’s not so easy to do. Here is an example from my favorite Korean learning site – KoreanClass101 – where you can listen and read along. As you can see below, the audio lesson comes with reading material. Simply put, reading is a lot easier when you can follow along with audio. You can also read faster if you practice again and again. You understand which word is which with the audio. You get instant translations and instantly know what you’re reading. Grammar comes a lot easier as you see it in action. If you read out loud – and do it again and again, you can speak faster. Hearing the pronunciation helps yours. 2. Record your voice and compare your pronunciation with native Korean speakers. 자신의 목소리를 녹음하고 한국어 원어민과 비교해 보세요. Jasinui moksorireul nogeumhago hangugeo woneomingwa bigyohae boseyo. Highly uncommon advice. However, if you record your Korean speaking… and compare it with a native speaker… you will INSTANTLY hear the difference. The result? You adjust yourself and you speak better Korean. If you do this… this strategy that will make you sound BETTER than any self-learner. How would you know how bad you sound… if you’ve never heard and compared yourself, huh? Great for perfecting your Korean pronunciation. 3. 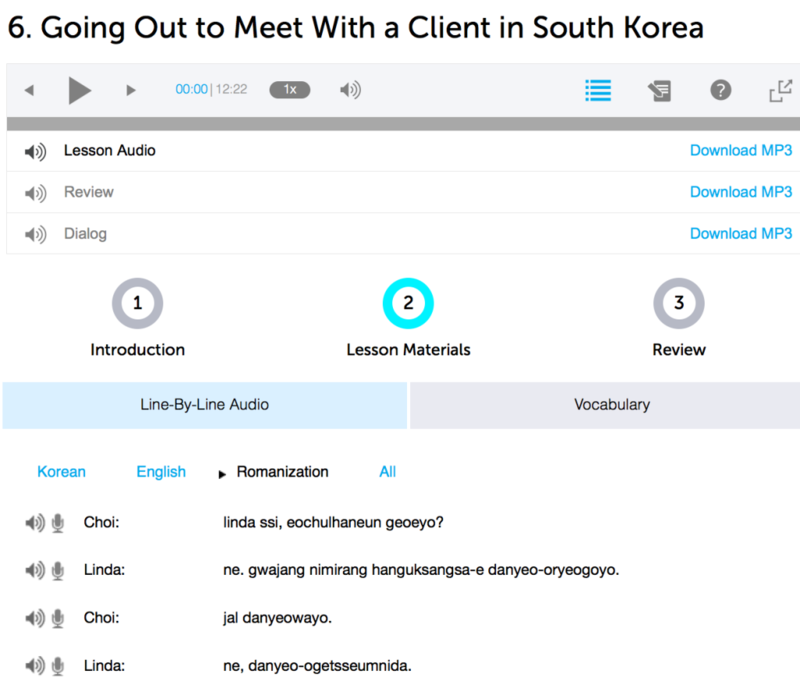 Download dialog tracks and listen to the Korean conversations. 대화 트랙을 다운 받아서 한국어 대화를 들으세요. Daehwa teuraegeul daun badaseo hangugeo daehwareul deureuseyo. Imagine cycling through flashcards. You learn words or phrases. That’s nice…. but empty. Words are just words. Now Imagine having a playlist of Korean conversations & lessons on your iPhone. Just Korean. No English. You can listen and re-listen and listen until real Korean conversations are stuck in your head. The magic here to is to re-listen many times over. I always add new lessons to my iPhone music playlist. Then, I’ll re-listen (and try to repeat) several times a day. Sometimes I pay attention and check every word, other times, I just listen to refresh myself. 4. Repeat the phrases that you hear out loud again and again. 들리는 문구를 계속 큰 소리로 반복하세요. Deullineun mungureul gyesok keun soriro banbokaseyo. Why repeat? Well, in order to speak Korean…. you must open your mouth, push some air out of your throat, emit sounds and… SPEAK Korean. Repetition is the mother of all learning for a reason. It’s how brainwashing is done. It’s how marketing works on you. And it’s how people master a language. If you repeat a phrase once, or twice, you’re kidding yourself. 5. Review old lessons to master them completely. 지난 레슨을 완전히 마스터 하기 위해 복습하세요. Jinan reseuneul wanjeonhi maseuteo hagi wihae boksseupaseyo. As soon as people are done with something… they move on. Finished an App? Move on. Finished a video lesson or work book? Move on. The magic to fluency is in reviewing (again, repetition). Noone remembers things on their first try. Or second. But with enough reviews – you’ll be mastering Korean. 6. Stay motivated by tracking your learning progress with the Dashboard. 대시 보드로 학습 진행 상황을 파악하여 의욕을 잃지 마세요. Daesi bodeuro haksseup jinhaeng sanghwangeul paakayeo uiyogeul ilchi maseyo. How many Korean words do you know? How long can you speak Korean for… – 5 minutes, 10 minutes? You should know the answers to these questions. I know how many lessons, flashcards and hours of Korean I’ve studied. By tracking your progress and knowing how much you know… you become invested in the language. Imagine, what if you knew 500 Korean words and phrases. That’s a lot. That tells you that you can get to 520, 550, 600. And soon enough, 800. It goes on. This is great for motivation. If you sign up at KoreanClass101, you can track your progress (lessons, hours, flashcards, % of series completed) with the Dashboard as shown above. 7. Read lines slowly at first. Then re-read and increase your speed. 처음에는 대사를 천천히 읽으세요. 그런 다음 다시 읽으면서 속도를 높이세요. Cheoeumeneun daesareul cheoncheonhi ilgeuseyo. Geureon daeum dasi ilgeumyeonseo sokdoreul nopiseyo. This is reviewing as well. However, THIS is what helped me read FAST and speak FAST. Any new sentence I started – I started reading slow. Then, I’d read it a little faster. Then, I could read it with a single glance. At the same time, you familiarize yourself with more words and Hangul. This makes future reading easier. This is great with any reading material you choose. Textbooks. Audiobooks. Audio Lessons with scripts. 8. Set small and measurable learning goals with a deadline. 작고 측정 가능한 학습 목표를 기한과 함께 설정하세요. Jakgo cheukjeong ganeunghan haksseup mokpyoreul gihangwa hamkke seoljeonghaseyo. Measurable: So you know if you reached it our not. If your goal is to learn 100 words – either you know 100 words or not. Either you finished 1 chapter this week or not. Done. No arguments. Deadline: Believe me – nothing in school or in the working world gets done WITHOUT a deadline. If there was no deadline, nobody would do anything. Set your deadlines – by when do you plan to accomplish your small goal? When will you learn Korean? Set a deadline! 9. Try harder lessons to challenge yourself and improve faster. 자신의 능력을 시험하고 더 빨리 실력을 향상시키기 위해 어려운 레슨에 도전해 보세요. Jasinui neungnyeogeul siheomhago deo ppalli sillyeogeul hyangsangsikigi wihae eoryeoun reseune dojeonhae boseyo. Do you know what people do at the gym to get stronger? Know how you can improve your Korean? Try lessons that are too hard for you. Yes, you will struggle. You will feel discomfort. However, struggling is a sign that you’re improving. See, most people don’t get this because its uncomfortable. It feels bad. But if you can understand that – when it “feels bad,” that’s when you’re learning – you’ll be much more open to struggle. 10. Improve your listening skills by reviewing each line of the conversation with the Line-by-Line Audio tool. 라인바이라인 오디오 툴을 사용하여 대화의 각 대사를 복습하고 듣기 능력을 향상시키세요. Rainbairain odio tureul sayonghayeo daehwaui gak daesareul boksseupago deutgi neungnyeogeul hyangsangsikiseyo. What’s the line by line? It’s an interesting tool (that really should be it’s own app & learning method) over at KoreanClass101.com. Basically, it breaks down the entire Korean conversation … line by line.. so you can read each line – in Korean or with English translations. And you can listen to each line, again and again as you read. Very effective for understanding a Korean conversation 100%. What are your favorite Korean learning strategies? Let’s make a HUGE master list of strategies for new learners. Add yours in the comments and I will add it to this list. P.S. I highly recommend this for Korean learners. If you REALLY want to learn to Korean with effective lessons by real teachers – Sign up for free at KoreanClass101 (click here) and start learning!